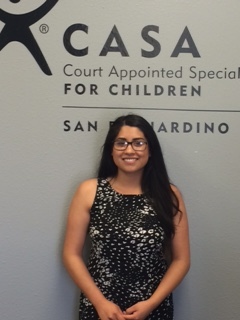 My name is Maribel Morales and I am an Advocate Supervisor with CASA as well as a Volunteer. I first learned of CASA while doing my undergrad studies at CSUSB. I became very interested in learning more about youth in foster care and after graduating, I became a Volunteer in 2013. Becoming a volunteer has been by far one of my most rewarding experiences. Although challenging at times, I am very thankful that there is such a great organization designed to help so many youth in need of someone to help guide them through the ups and downs of life. In 2015 I came on board as an employee and I am continuously learning more and more about the foster care system and how it is affecting so many young lives. I hope you all take a moment to learn a bit more about what CASA is all about and decide to take the next step and become Volunteers as well.